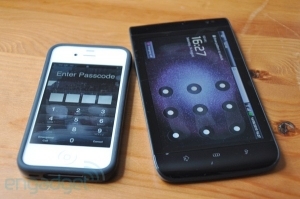 Display smudge may give away your Android unlock pattern | Android Blast! A recent security research report by the University of Pennsylvania says Android users could be giving away their unlock patterns by leaving of trails of oil from their fingers on the phone's display. Did we really need a research report to tell us that? The report says that even after the display comes in contact with clothing, the "smudge attack" can be successful because sometimes partial patterns are left behind. If you're worried about losing your phone and getting smudge attacked, just upgrade to Froyo. Android 2.2 now has the ability to leave a numeric password instead of a pattern.